Last week, California regulators ordered Uber to take its self-driving cars off the road, saying that the vehicles did not have a special permit that classified them as test vehicles. The company also needed to provide proof that it was financially sound, had qualified drivers, and could guarantee that it would report collisions to the state. Uber attempted to stand firm, saying that it didn’t need any sort of special permit to operate the vehicles. “From a technology perspective, self-driving Ubers operate in the same way as vehicles equipped with advanced driver-assist technologies, for example Tesla auto-pilot and other OEM’s traffic-jam assist. This type of technology is commonplace on thousands of cars driving in the Bay Area today, without any DMV permit at all,” said Anthony Levandowski, Uber’s chief technology officer. But after mounting pressure from the state, the company has decided to pick up and move its driverless car program to Arizona. Perhaps in a dig to California, it says that it is excited to expand the program with the support of Gov. Doug Ducey. The fallout in California wasn’t totally unpredictable. The state has had a long history of imposing tough regulations to protect the safety of its consumers. However, many companies have said that the state’s stringent rules hamper innovation and the emergence of new technologies. 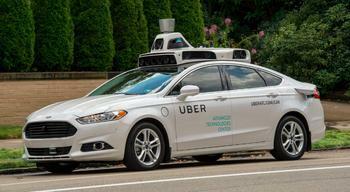 Uber officials believe that is especially true of self-driving vehicles. “This technology has the potential to dramatically improve society: reducing the number of traffic accidents, which today kill 1.3 million people a year; freeing up the 20 percent of space in cities currently used to park the world’s billion plus cars; and cutting congestion, which wastes trillions of hours every year,” said Levandowski. For its part, Uber hasn’t totally given up on deploying its cars in California. The move to Arizona to test the program may be more of a move of convenience, since its state laws offer less regulation. But, eventually, the company hopes that it will be able to work through its issues with California regulators to get its cars on the road. “We’re now looking at where we can redeploy these cars but remain 100 percent committed to California and will be redoubling our efforts to develop workable statewide rules,” the company said in a statement.